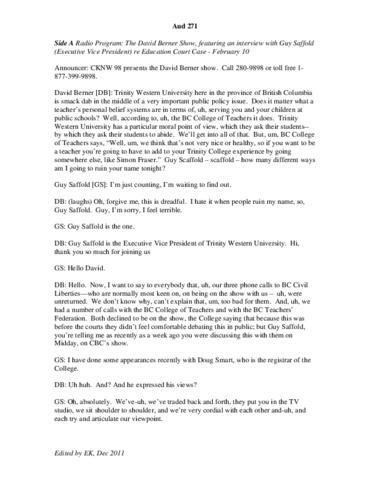 Guy Saffold, Executive Vice President of Trinity Western University, is interviewed at length regarding the Trinity Western University Legal Challenge by host David Berner. They discuss the details of the case and the nature of the "community standards" document at TWU. Near the end of the recording they begin taking calls from listeners; they are cut off in the middle of a sentence. While this audio cassette is filed with the A/V collection, it belongs to the Legal Challenge Collection.